After years of watching the subtle inefficiencies that take place on the pseudo typical assembly bench I have created a custom bench of equal quality and design to our amplifiers, for our amplifiers. It’s the machine that builds the machine – if you will. I think of it as a 1650 lb zen amp – with it’s own environmentally controlled room. 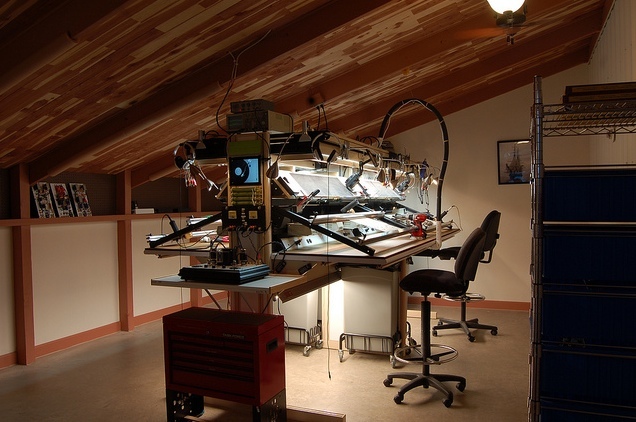 As you know, Decware is not a manufacturing facility, it’s an art studio. Everything is hand built. There are 4 zen masters who make all of the amps. Each with 20~35 years experience on the bench. You can view a slideshow of the entire room here! Decware has retired it’s original blog and replaced it with a new one that employs all the most recent technologies, is auto updating, mirrored on over 100 servers, and spam proof. Our original blog will stay up so that people can continue to find and read it’s wealth of audio articles and posts. You can find the original Blog here.